The Minister for Housing has called comments made by Fianna Fáil's housing spokesperson Darragh O'Brien the most useless contribution to the housing crisis. 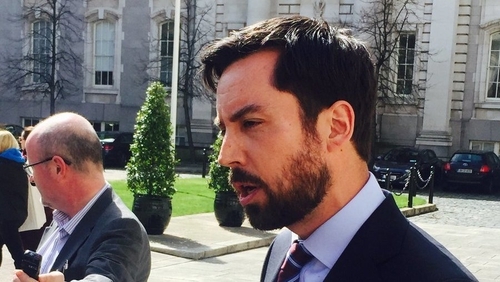 At the weekend, Mr O'Brien said that Minister Eoghan Murphy and Taoiseach Leo Varadkar were too elitist to deal with the housing issue. Mr Murphy said it was clear from comments made by a number of Fianna Fáil frontbenchers that they were trying to undermine the confidence and supply deal with the Government. The agreement runs out after the next Budget. Responding to Mr Murphy’s criticism, Mr O’Brien said his issue is with the Government’s approach to housing and it is not personal. He said he would be constructive in his dealings with the minister, but would not be silent. Earlier, the Cabinet approved the general scheme of a bill that would make it a criminal offence to increase rents by more than the 4% a year cap in rent pressure zones. The bill would also give the Residential Tenancies Board (RTB) the power to initiate an investigation, rather than waiting for a tenant to make a complaint. Mr Murphy has said he will consult Minister for Finance Paschal Donohoe on possible incentives for landlords in situations where a property has been sold. Speaking at Leinster House, he said he hoped the bill is passed before the Dáil takes its summer break. He said under the bill fines would be imposed on those who breach the cap, while jail sentences were being considered for landlords who provide unfit accommodation. There have been calls for the strengthening of tenant's rights and the enforcement of rent pressure zones by opposition TDs. Speaking on RTÉ's Today with Sean O'Rourke, Róisín Shortall said she welcomed the Government's proposals, saying that the RTB needed to be properly resourced and given additional powers. Ms Shortall also said much greater action needs to be taken in order to resolve the housing crisis, including tackling the problem of land hoarding. The Dublin North-West TD added that the Government needs to start building on State land. However, a spokesperson for the Irish Property Owners' Association says continual interference in the rental market means investors are losing confidence and leaving the market. Margaret McCormack says this in turn leads to less available property. Speaking on the same programme, she said there is less accommodation available now than there was 12 months ago. The situation in its current form is untenable, she added. Sinn Féin's housing spokesperson has broadly welcomed Mr Murphy's bill, saying that his party has long argued for stronger powers for the RTB. Speaking on RTÉ's Drivetime, Eoin Ó Broin said most landlords obey the rules and provide a quality service but, he said, a significant amount of others do not. He said that the minister's approach is sensible, and that there clearly should be sanctions for landlords. Mr Ó Broin said additional resources will be needed for local authorities to conduct inspections. He also called for additional resources for the Residential Tenancies Board. Earlier, the party's leader said Sinn Féin will not be moving a motion of no confidence in Mr Murphy at the moment as it is too close to the referendum on the Eighth Amendment. Mary Lou McDonald said Sinn Féin does not have confidence in Mr Murphy or the Government on the housing matter. She added that the clock is ticking for the minister and Sinn Féin would be putting a big emphasis on the housing issue.